We Indians are very opinionated about everything. You mention a particular dish and chances are that someone’s mother or grandmother has the best recipe and you can’t argue with them on its validity, because they are defending the recipe of their nearest and dearest. Neither my mom, nor my grandma could or would address this bird in their strict Brahmin vegetarian kitchen, so I took it upon myself to offer you a version that I think not only delivers a succulent dish but does so with few ingredients and some key cooking techniques. I trust it will leave you in that Oliver Twist predicament of asking for more. No worries, you will not be chastised, at least not at my table. Serve curries, such as this one, with some flatbread (either homemade All-Wheat Griddle Breads, or store-bought) and steamed rice (or a rice pilaf) to soak up all that creamy sauce vibrant with spices. 1. Heat the oil in a large skillet over medium-high heat. 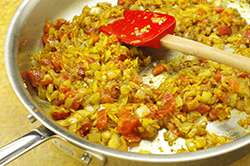 Once the oil appears to shimmer, add the onion, garlic, and ginger, and stir-fry until the onion is light caramel brown around the edges, 4 to 5 minutes. 2. 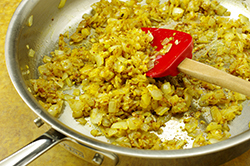 Sprinkle the spice blend into the skillet and stir to mix. Let the spices roast in the onion medley until the aromas dramatically change, 10 seconds. Pour in the tomatoes and stir once or twice. Lower the heat and simmer the chunky sauce, uncovered, stirring occasionally, until the tomato pieces soften, the excess moisture evaporates, and some of the oils in the spices start to dot the edge of the sauce, 5 to 7 minutes. 3. 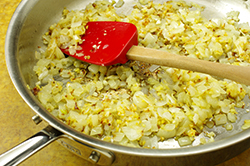 Pour the half-and-half into the skillet and scrape the bottom once or twice to release any bits of onion, garlic, and ginger, effectively deglazing the skillet and releasing those flavors back into the sauce. Transfer the chunky curry to a blender. 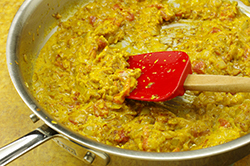 Holding the lid down, puree the curry until it is slightly curdled looking but smooth, and saffron orange-hued. 4. Return the sauce to the skillet and stir in the chicken and salt. 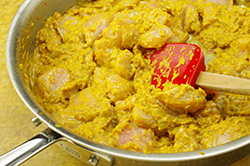 Simmer the curry, covered, over medium-low heat, stirring occasionally, until the chicken, when cut with a fork or knife, is cooked through, no longer pinkish-red, and its juice run clear, 12 to 15 minutes. 5. 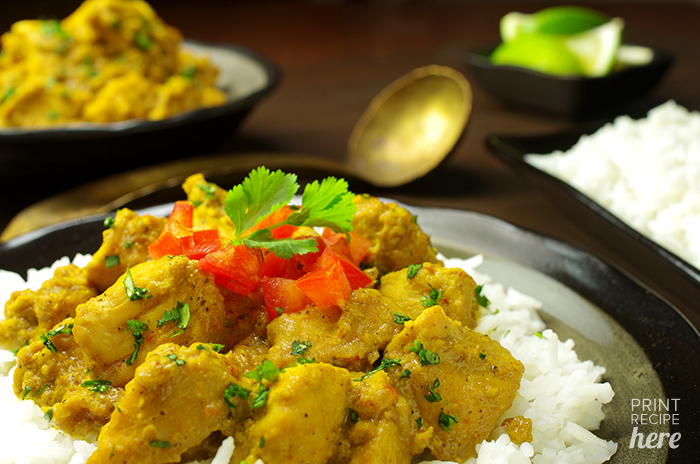 Sprinkle the cilantro on top of the chicken curry and serve. The other “white” meat, pork, does work well as an alternative to chicken and so will beef, lamb, and turkey. Each meat will contribute its own distinct flavors and will cook to completion at a different time. 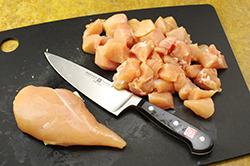 If you like bone-in pieces of chicken by all means use them as they will provide more succulence and a deeper flavor. Just be careful of the bones. 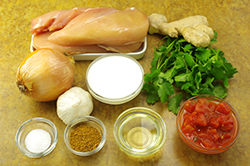 Chicken thighs, cheaper in price but richer in taste, are an overlooked cut and will deliver a more complex gusto. Yes, cubed tofu or potatoes will be fine instead of the chicken for the vegetarian at your table. Tofu will be done cooking in 10 minutes; potatoes in 15 to 20 minutes, depending on the size of the cubes. Any leftover curry is also great when you spoon it over warm, flaky buttermilk biscuits the next morning for breakfast, giving ho-hum biscuits and gravy a run for their money. 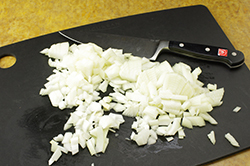 The recipes that use this blend often instruct you to add it when you are stir-frying something. If you were to sprinkle the ground mélange directly into hot oil or a preheated naked skillet, it would yield burnt flavors and unappealing aromas. 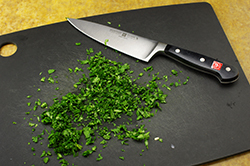 The cushion that vegetables provide is essential to safeguard the blend from burning on contact with the heat. This is not a masala (blend) that you can add as a finishing mix since the spices need to cook for a smoother quality. 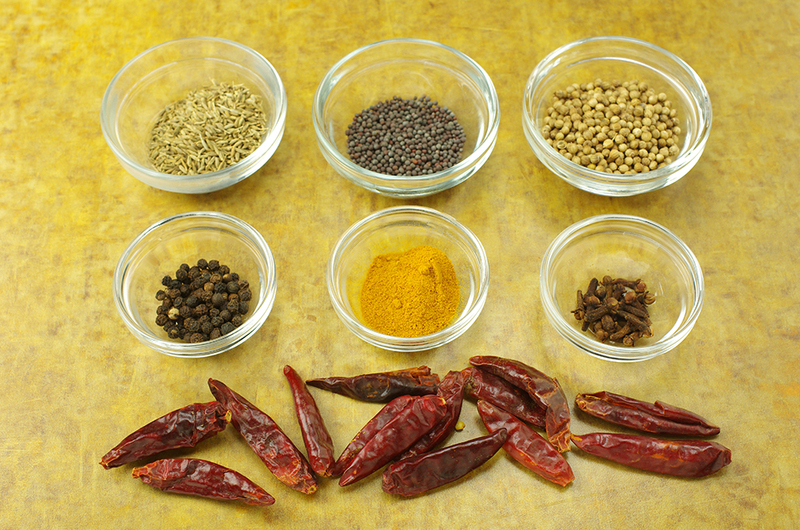 Grinding whole spices prior to use is the best way to showcase their sensual fragrances and tastes. 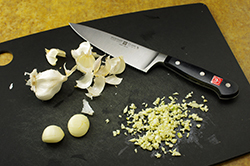 The aromatic oils within emerge when freshly ground, providing a greater depth of flavors. 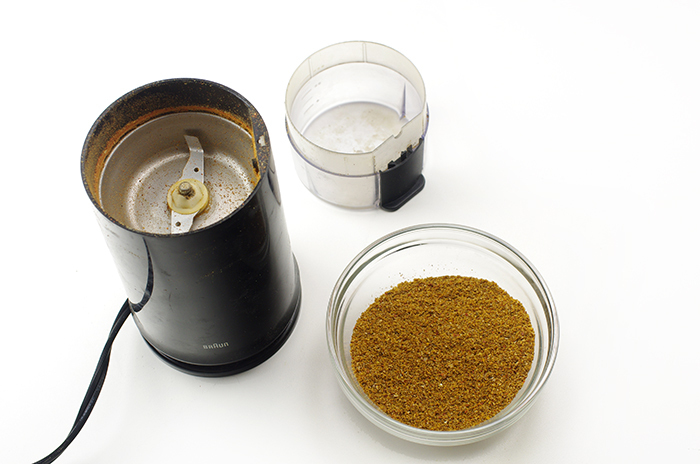 A spice grinder, essentially a coffee grinder, works well for pulverizing amounts greater than 1 or 2 teaspoons whole spices. If you double or triple the batch, a blender does a nice job of crushing them all at once. The narrower the base of the blender jar, the better the grind. Wide mouthed jars are best reserved for shakes and blended cocktails. If you cannot procure whole dried red chiles, use 2 teaspoons ground red pepper (cayenne) instead. For a less potent blend, you can use sweet paprika for half the amount of chiles; add 1 teaspoon paprika plus 1 teaspoon ground red pepper.